Its true! I can touch type without even looking at the monitor, with an average WPM of 60+ (most people can! Are you most people? ), but then sometimes LOVE is not enough. 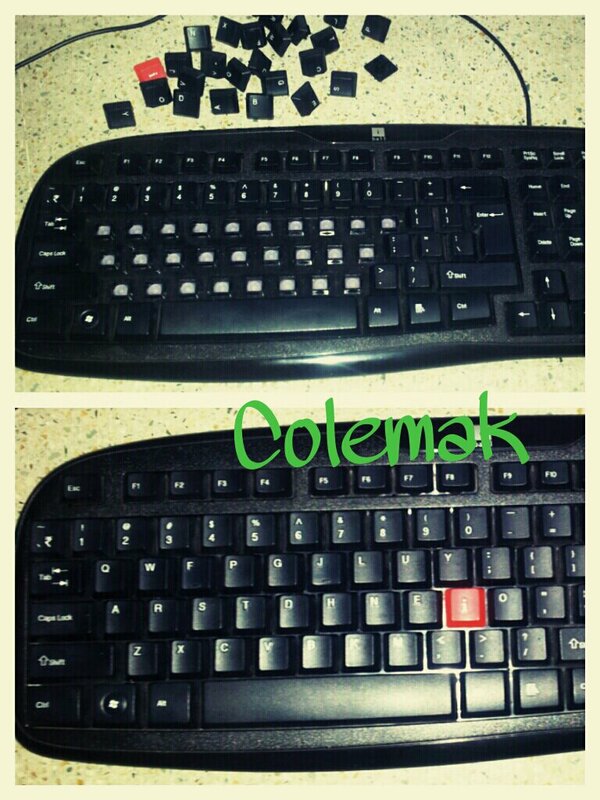 Colemak etc are less prone to typos. Ideally all you need is an OS that understands the layout. All modern operating systems do. That’s how you can switch layouts in Windows Ubuntu etc (just google). Optionally, if you are like me – feedback is vital. Pop the keys out and rearrange! The red “i” has landed on the home row. Good stuff. Please don’t do that to your laptop. USB keyboard is pretty easy to acquire. Q. All said and done – Why is QWERTY still in production? A. I don’t have to answer that as we all know what will happen if you go to your manager/boss and ask him to sponsor this migration. For him all that’s expected out of you is that you ‘deliver’ – which you are already capable of. PPS: Yes! I used Colemak to write this post. Q. How to Switch in Android? A. Google Keyboard is the answer. Get the app. This is definitely cool. Gesture typing is fun.